Glass tile is an amazing option for any homeowner. Glass tile is typically used to accent bathrooms and kitchen areas, but you can use throughout your home. Choosing glass tiles allows you to give your space a unique aesthetic and increase your home’s resale value. Glass tile is a collection of small mosaic tiles made from glass. It comes in many varieties, colors, finishes, and textures. The right type of tile in the right location is always a conversation starter. Simply put, glass tile is an element that makes a home unique. There are many benefits to accenting a room with glass tile. It is very easy to maintain. You can clean it with just a wipe of a rag. Glass tile also reflects light, which brightens the room, making it feel bigger and more open. It resists frost, doesn’t dull with extended exposure to the sun, and is impervious to water. The colors never fade. Glass tile has unparalleled beauty. It is vibrant and alive. It can be shaped in whatever design you choose. Kermans flooring talented design consultants help you with everything from planning to installation. Glass tile can be used almost anywhere you desire. 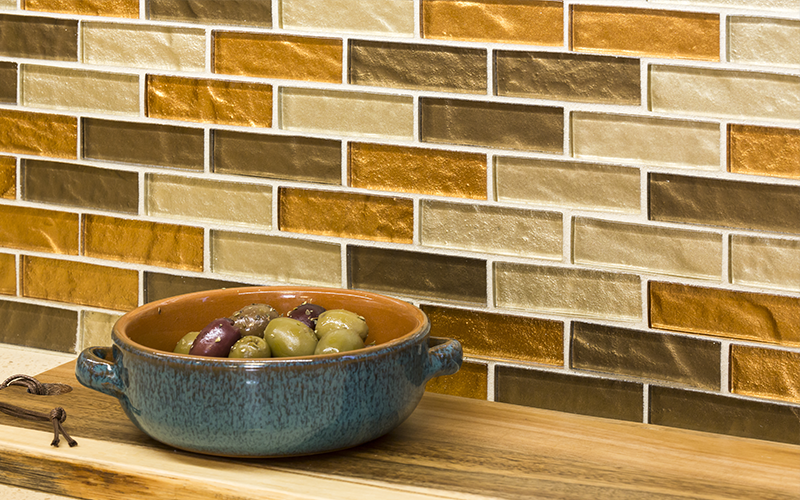 From a larger piece to an accent, glass tile makes a material and aesthetic difference. The inherent water-resistance of glass makes it perfect for a kitchen back-splash or in the bathroom near a tub or shower. Anywhere there is water there is a benefit to using glass tile. You can also use glass tile to accent a fireplace. In this kind of installation, light from dancing flames will refract along the surface of the glass tiles. What is the best way to install glass tile? Glass tile done well is amazing. However, glass tile done cheaply looks, well, cheap. Glass tile is an investment in your home. Our team of designers understands the nuance of glass tile, and they can help you make detailed plans and arrange for professional installment. Kermans Flooring has a large variety of glass tile options: dozens of colors, designs, and treatments. We have specialists that deal directly with you, and we will stay with you through the entire experience. Learn more and schedule a free consultation.